I hope that everyone is winding down their 2010 and looking forward to 2011. There is 5 shopping days left for Christmas, so that means only 8 days left till my 33rd BIRTHDAY! Whats up for New Years Eve this year? 1. Joes American bar and grill no longer has onion strings, BOO! 2. Jeffrey can bang out putting in a new light fixture in under 15 minutes. 3. Bread bowls are under rated. 4. The malls were not overly crowded this weekend. I figured they would be with Christmas around the bend. 5. The HBO 24/7 show about the Winter Classic between the Caps and Pens is down right awesome. 6. Smiddy may be a closet pyromaniac. 7. I didn't think the A-Team remake was as bad as people say. 8. 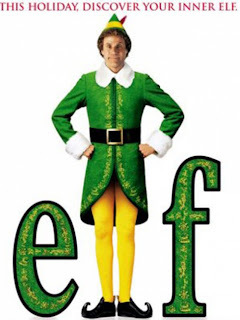 I haven't seen one Christmas movie this year, and I was looking forward to seeing ELF on repeat. 9. Harrows Chicken pies are not all that good. 10. Crime goes up around the holidays. Watch your wallets. 11. People assume when you get married your life just ends. 12. Good to see Jeb out and about on a Sunday night. Its great to see him not only on dart nights. 13. Our christmas tree has been up since we got back from our honeymoon yet we haven't done anything but string up the lights. 14. I still can't figure out what kind of gift card to get for a yankee swap. Any suggestions? Yankee Swap Gift Card to the Sullivan's Tap, that way you can pick it and use it before a B's game. Enjoy the week while thinking of this hottie!